There are a huge number of massively popular web only shows that users watch and download every day. Clicker.com is a web video database company that is now making it easier for you to watch and download your favourite web series on your iPhone, iPad and iPod Touch. It has just launched its iOS app for all 3 devices and promises to bring an iPad-specific version soon. The app allows users to search, watch and discuss 1,800 web shows (there are about 200,000 episodes in all), and download and watch 12,000 additional shows from iTunes, though you could obviously do that last part on your iPhone already. This is not all. 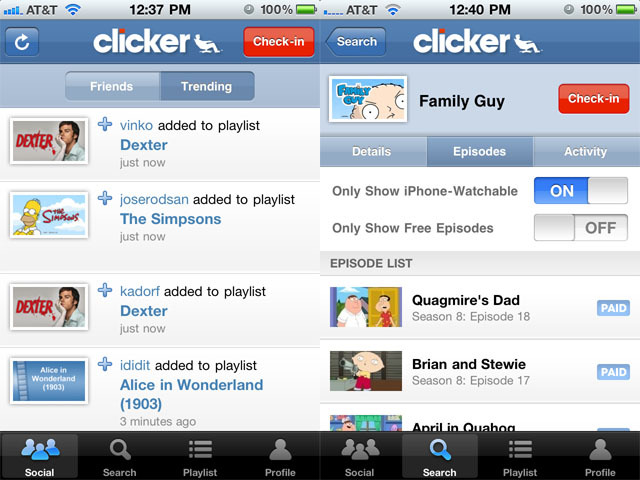 The Clicker app also allows you to check-in to TV shows like on Foursquare and Philo. You can see what your friends are up to, what shows they’re watching and what shows are trending in the news feed. Checking in to TV shows and movies is the new craze in the location universe and Clicker is taking it to web series. If a friend recommends a show but it’s not available on mobile, you can still make a note of it in the app and watch it when you get to a laptop or a desktop computer. With more and more users watching all entertainment (TV, movies, music) online, web series are a phenomenon that will only grow in the future and bringing the content to mobile devices is a very logical step. Check out the video below to get a preview of the Clicker app. Is Apple Ready To Come Clean On the iPhone 4?